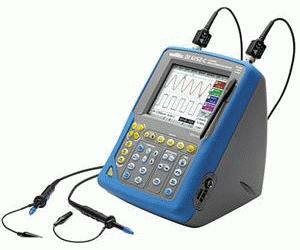 The OX 6062 oscilloscope is also a "real-time" FFT analyser. With its two 300V-Cat.II measurement channels , it also offers up to 4 curves on screen. Ergonomic and particularly compact, the ingenious built-in stowage space can be used to carry the accessories and the power cord. On the front panel, 28 direct control keys and Windows-like menus make it even simpler to use.